locate it for you. If anyone can, H VAN WORLD can! 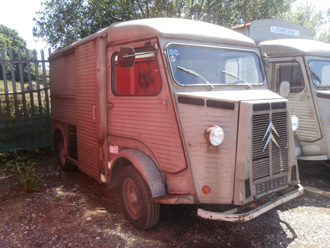 A rare extended length Citroen HY van. 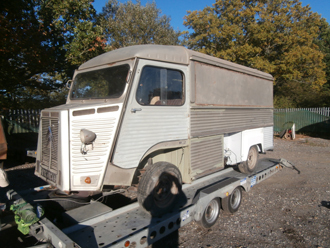 The van was being restored by its French owner and a huge amount of work has already been done to it. All the new panels are with the van and it does start and drive. 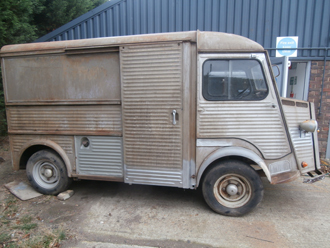 We will be fully restoring this van, or you can buy it 'as is' and finish it yourself. A superb and rare example, for sale as it is for £12,000. Long wheel base H vans are very hard to find now. This one runs and drives but needs restoration. It has an opening side hatch on each side with a drop down shelf. We can arrange delivery or you can arrange trailer collection. 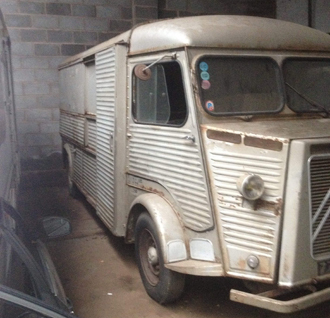 Another very rare long wheel base H van! 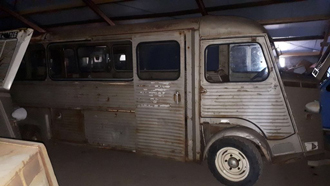 The van will require restoration or would make a great static van if you have a permanent pitch. We can arrange delivery or you can collect by trailer. Probably the cheapest long wheel base van anywhere at just £11,300 as it is. 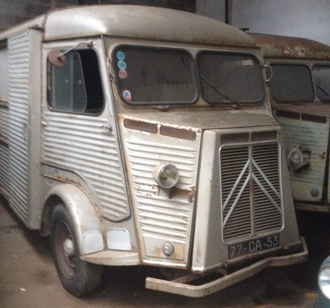 A recent find from mid France - very sound and original H van in 'as found' condition. 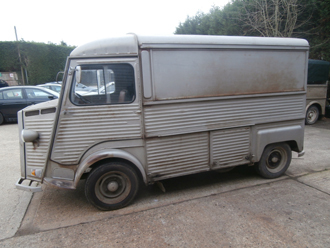 We will be fully restoring this van or we can sell exactly as it is for you to restore. The body is much better than it looks in the pictures and the important underside is excellent. Needs a full rebuild mechanically, of course, or you could have it as a static van. 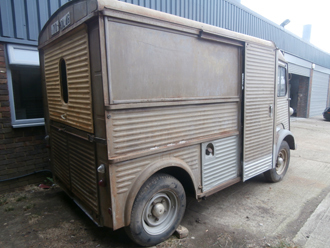 Another rock solid, unwelded and all original paneled Citroen H van - we have found some real beauties recently! 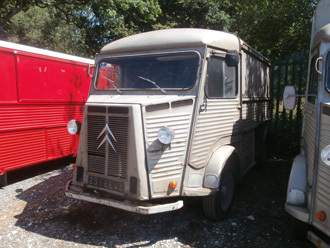 This one had been stripped by its French owner as he was intending to fully restore it himself. As so often happens, other things seem to have got in the way! 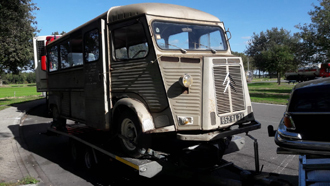 Currently the engine and gearbox are sitting in the back of the van, so we can either sell as is or build it into a static engineless van or a fully restored and driving example. Price will obviously depend upon how you want it, so talk to us! 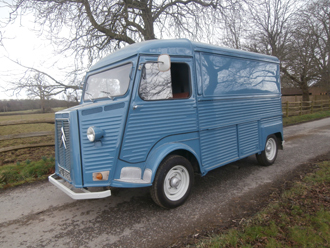 A lovely, newly painted and mechanically restored Citroen HY van. 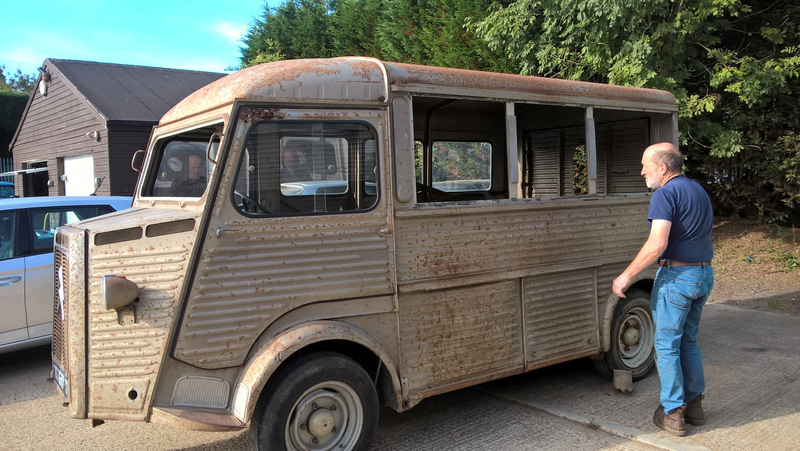 We were very pleased to find this van as it has really nice original but surprisingly solid and straight, sides and was generally very solid even before we started work on it. This beauty is UK registered and MOT tested and ready to drive away. Alternatively, we can alter it and fit it out inside to your specification. As is, £21,245. No VAT on this van. 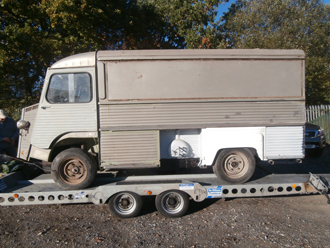 We are delighted to have been able to purchase such a sound, straight Citroen H van. 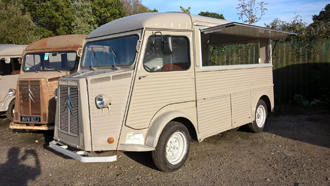 Currently the van is not fitted with an engine or gearbox so it would make an amazingly perfect static catering van or promotional vehicle etc. Alternatively we can fit a rebuilt petrol engine with a rebuilt gearbox, new radiator, exhaust, brakes, tyres, seats etc.and paint your chosen colour. Price will obviously depend upon your chosen specification. A really amazingly good base vehicle - very hard to find in this condition. 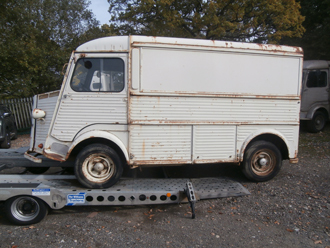 One owner from new, never welded or painted......not a description that you would expect to be applied to a 47 year old H van! But, amazingly, here it is! A beautiful original example which runs and drives. We will sell exactly as is, or we will restore mechanically in our workshops. 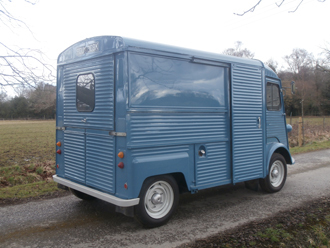 Talk to us - we can build this lovely van to your specification. A most unusual opportunity indeed. Another newly completed and simply beautiful example. Full body restoration, new side opening hatch fitted and then painted inside and out. Full mechanical restoration including all new brakes and brake pipes, new radiator, new petrol tank, new stainless exhaust system, new water pump, new tyres, new lights etc etc. Totally rebuilt and recovered seats, UK registered and MOT tested. 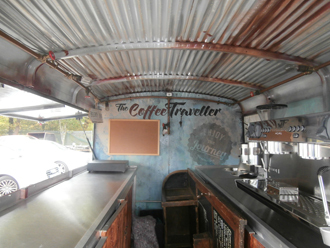 Newly completed, this lovely late H van is ready to become a coffee bar, wine bar or whatever you plan to sell. 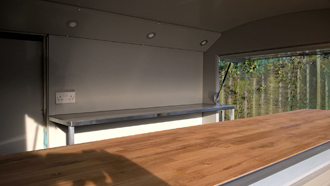 The van has been bodily and mechanically restored by us and then fitted out inside to a very high standard with full insulation, ply lining and grey aluminium wall and ceiling covering, side opening, real oak customer counter, stainless rear counter, polyflor non slip flooring, lighting, electrical sockets etc. Here is an unusual one! 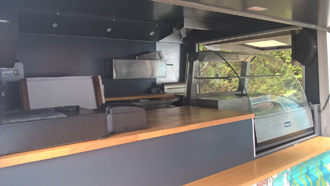 Fully converted early split screen H van coffee sales van with two gang coffee machine, basins and grinder, plus everything else you need to run the business. 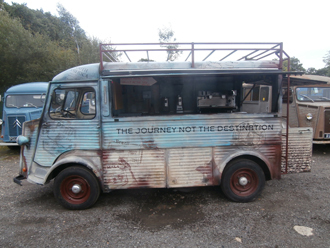 The van has been beautifully painted to look aged and rusty.....but that is just the paint effect and air brushing! 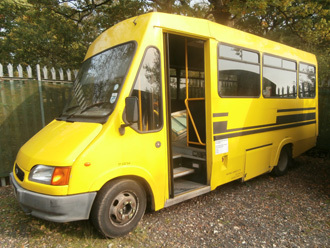 This van is rock solid and will be sold fully serviced and MOT tested. Ready to trade. 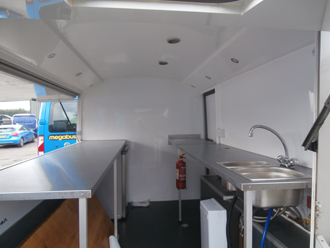 A superbly fitted out H van with oak counters, fully lined and insulated interior, two basins with hot and cold water, non slip floor, fridge, push out glass display cabinet and full interior lighting and electrics. The van is for sale 'as is' with a problem with its diesel engine. Ideal therefore for anyone with a fixed pitch. However, at additional cost we can fit another engine, either petrol or diesel. Talk to us or better still, come and view. This example, one of the very last to be built (production finished in 1981) has been totally restored, both mechanically and bodily. It has new brakes, tyres, stainless exhaust, radiator.......you name it! Then, off to the bodyshop for a repaint in its original colour of gris matinal - superb! 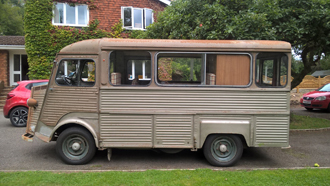 Finally, we fit new seats, new window frames and have it MOT tested. 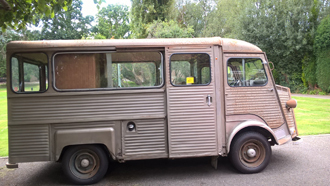 Believe it or not, this beautiful original van had been locked away for over 30 years! It took some serious manoevering to release it from its incarceration, but succeed we did. And it was worth it. Original paint and original dents, but solid. We have carried out a total mechanical restoration including brakes, engine, tyres, exhaust, radiator, seats etc. 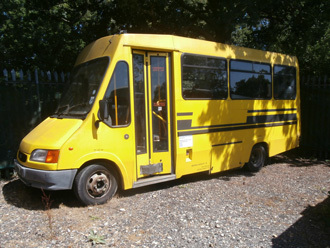 It is now MOT tested (as all our vans are) and will be UK registered in days. 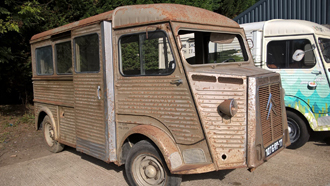 If you like the original patinated look, you will love this van. Drive away for just £18,000 plus VAT. As usual we can paint it, fit it out....or whatever! Recently owned by our local council, this superb bus drives very nicely and has masses of space inside. 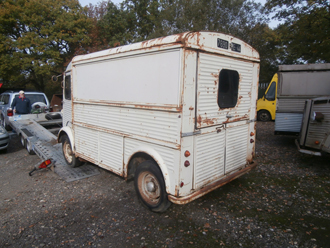 The passenger seats have been removed, so this van would make an amazing camper or catering, promotional vehicle. Whilst we have had it, the MOT has expired though it still drives very well. Because of this, we will sell for just £3500. If nothing else, you could use it as a superb shed !! It really is too good for that though. A brand new build, ready for action now! As much space inside as an H van, but a cheaper alternative. 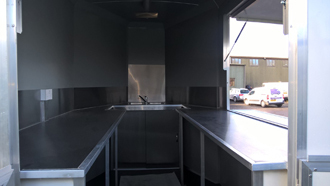 Fully lined out inside and fitted with counters, lighting, electric power points, electrical hook-up, two basins with water heater, side opening hatch with drop down customer shelf and non slip flooring. 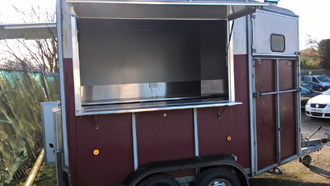 The trailer itself is fitted with four brand new tyres. one that you might find on Ebay or similar websites. 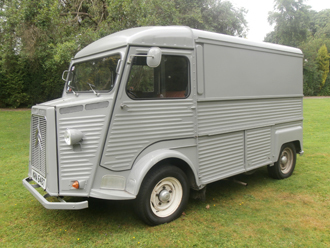 This van is without doubt the best and most correct H van currently for sale. The van is newly MOT tested and UK registered, ready to be driven away, or we can fit it out inside for you before you take it. 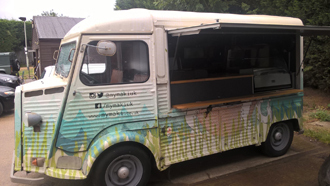 Would make a really superb promotional van for any product or company - £ Ask. 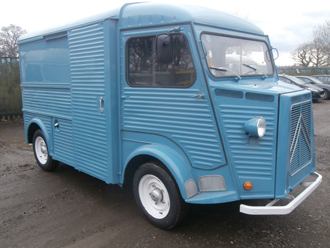 Built by us a little over one year ago, this superb van is ready to trade tomorrow! with oak customer shelf, two counters, fire extinguisher and first aid kit. MOT tested, serviced and UK registered - ready to go! Perfect Van. We (and you!) 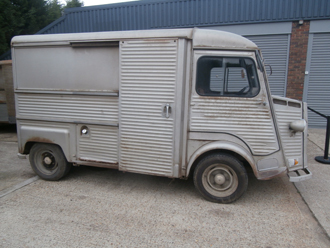 will find it nigh on impossible to find a better Citroen H van than this. 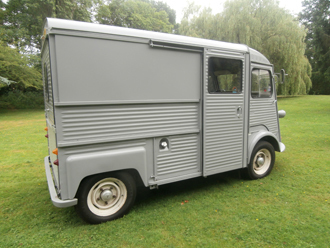 This is a fully restored (mechanically and bodily) sound original van that we found with a long term owner in Southern France. 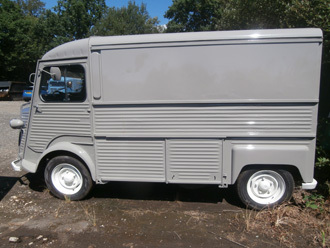 Repainted in its original Gris Matinal grey, this van is one of the last built (production finished in 1981) and is therefore to the very final specification. 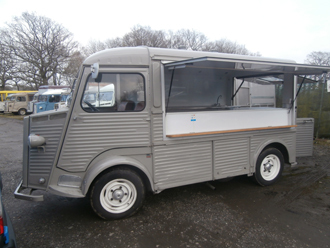 A really lovely van that we can convert inside to your exact specification or you can simply enjoy as is. The van is UK registered and MOT tested. Really lovely - £24,000 plus VAT. Best in the world? How can I start with this beauty? Perfect? Stunning? Just words, but you will not disagree when you see it. Found as a one owner from new vehicle in France with its original owner. 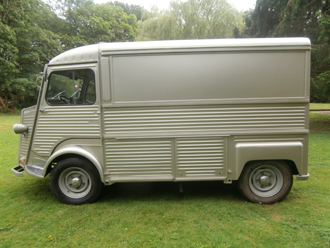 Although we have totally restored the van bodily and mechanically, no welding was required and no new panels! 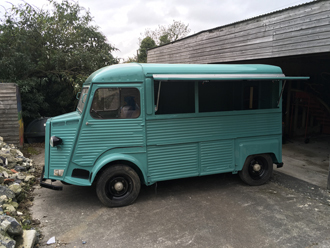 The van has been totally repainted inside and out in its original Citroen Gris Metallise, mechanically restored in our workshop, UK registered and finally, MOT tested. As ever, we can convert this to your exact needs and specification. You will never find a nicer, more original example. £28,500. Petrol. Rare extended length model. Well, well well, how special is this? We have used pictures from how we discovered this beauty in the Seine-et-Marne region, not far from Paris. The van is beautifully original and still in its original paint. 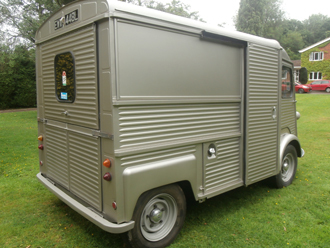 The body is amazingly sound and straight and it will form a really superb base for your special catering/promotion/camper van. Because of its extra length, these vans are always much in demand. We will put it through our normal mechanical and body restoration process and convert the inside, if you wish, to your own wishes. 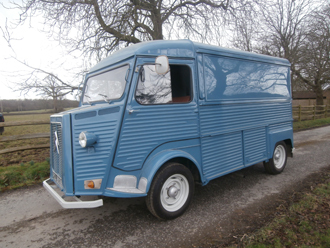 The restored van will be £23,600 plus VAT, painted your colour.